Villa Baris is a contemporary style, luxury villa with spacious terrace, infinity swimming pool. Its elevated position offers stunning. Villa Baris is a contemporary style, luxury villa with spacious terrace, infinity swimming pool. Its elevated position offers stunning, undisturbed views of picturesque Kalkan bay and the surrounding Taurus Mountains. 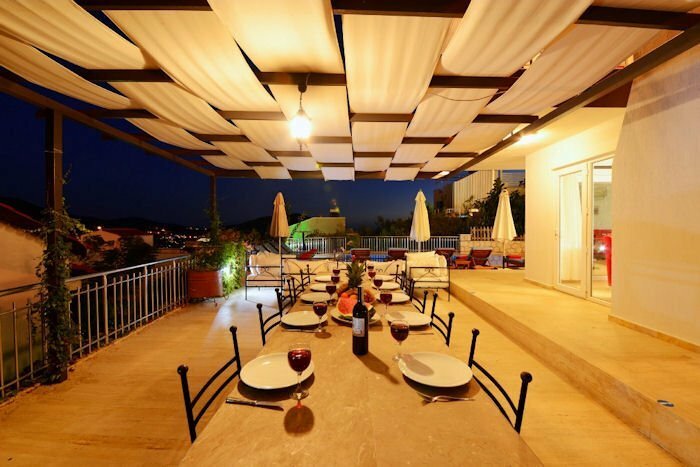 The villa is situated just a 5 minutes stroll from the centre of the enchanting Kalkan village and harbour, which is packed with delicious restaurants and is known as a premier holiday resort in the 'Turkish Riviera'. Villa Baris is a sumptuous and spacious privately owned, 6 bedroom, 6 bathroom villa for groups of up to twelve people looking for a luxurious holiday, and is an ideal base for trips to some of Turkey's finest heritage sites within the Lycian region. The fully retractable floor-to-ceiling glass doors allow the outside in and create a magnificent atmosphere of light, air and space creating a truly memorable holiday experience. If you love outside living, then Villa Baris is the place to be, with a great infinity pool, plenty of sunbeds and umbrellas, and private balconies with fantastic views on the upper floors. Villa Baris has, Single beds (4), double beds (4), dining seats for 12, lounge seats for 12. The villa will be cleaned and clean linens and towels will be provided for 12 people. Iron, iron board and washing machine. - Villa Baris has stunning sea view and nature view by the sunbathing area, private swimming pools and garden. - Dining table and chairs, seats 12. Stone built BBQ by the pool, veranda, table tennis, 12 Sun lounges and parasols at the patio area. - Infinity pool size: Width 5m. Length 8m. / Depth 1.60m. - The modern design fully fitted open plan kitchen, fridge freezer, dishwasher, washing machine, oven, microwave, electric kettle, toaster, dinner set for 12 people, pans, stew-pots, Cutlery, Knives and etc. There are available all of what you need. - Lounge area sea and nature view, classic seating group, LCD satellite TV, DVD player, WiFi, air conditioning, table and chairs for 12 people and access to pool and patio area. Bedroom 1 is en-suite double bedroom with air-con, wardrobe, vanity Unit. Bedroom 2 is en-suite twin bedroom with air-con, wardrobe, vanity Unit. Bedroom 3 is en-suite double bedroom with air-con, wardrobe, vanity Unit. Bedroom 4 is en-suite double bedroom with air-con, wardrobe, vanity Unit. Bedroom 5 is twin bedroom with air-con, wardrobe, vanity Unit. Share bathroom with bedroom 6. Bedroom 6 is double bedroom with air-con, wardrobe, vanity Unit. Share bathroom with bedroom 5. The main town of Kalkan is no more than 5 minutes away by car, or catch the water taxi which sails frequently from early morning to early evening. In the evening, select one of the exclusive restaurants along the marina offering a range of cuisines and serving great cocktails too! Rising up from the shore you will come to the Old Town of Kalkan, with narrow cobbled streets home to an array of shops selling Turkish wares from shoes to spices, ceramics to clothes, handbags to hand crafted souvenirs… Originally a Greek town, the ambience does not let you forget this - as the sun goes down the twinkly lights on the rooftop terrace restaurants illuminate offering you fantastic views as you dine. Kalkan has a small but pleasant beach only a few minutes’ walk from Villa Baris. Or, on the Western side of Kalkan, is Kalamar beach, which has a beach club and a couple of waterside restaurants to choose from. For anyone who does hire a car, a trip to Kaputas beach, east of Kalkan, is definitely worth a visit, if only for the scenery on the way! The beach itself is small but secluded and sandy - well worth a visit! Stroll down the hill to the water’s edge and you will find the small but beautiful marina where you can catch a boat to take you for an amazing day out at sea, or indulge in a choice of water sports from the beach club. For those who want to sample some true Turkish culture, then visit the ancient roman ruins of Patara. Or, a little further up the Western coast, you will come to the historical sites of Sidyma, Letoon and Xanthos. So whatever you desire for your summer vacation, Kalkan certainly ticks all the boxes - stunning scenery, charming culture, superb shopping, heroic history and delectable dining!